Figure 1. 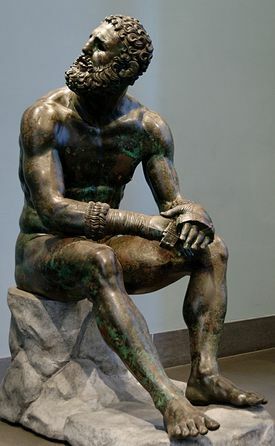 A Greek boxer from 300-200 BCE. Boxing is one of the oldest sports known to us. From very early historical records, to its professional development in the last century, and modern prizefights, the sport has become a global phenomenon watched by millions. Although modern boxing has a lot of similarities with its ancient cousin, the mix with television, big money, and big personalities has forever changed the sport. The earliest records of boxing emerge in the ancient Near East, where ancient reliefs from the 3rd to 2nd millennium BCE show boxers fighting and possibly wearing gloves. Ancient Egypt also has depictions of what appear to be boxers. We don't know the reasoning behind these early contests but most likely they were public activities watched by townspeople. 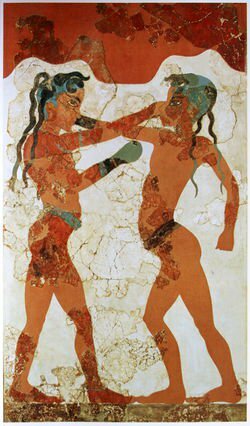 More records of boxing are found in ancient Mycenaean and Minoan periods in Greece, in the 2nd millennium BCE. In the ancient Greek city-states, boxing began to emerge as a formal sport that had rules, standardized equipment, and was part of the ancient Olympic games. The Iliad mentions a boxing fight that was a prizefight with crowds during a funeral being held. However, it is not clear that this was typical. The sport may have emerged as a way for men to prepare themselves for combat and prove their ability to fight. In the ancient Olympics, there are champions we know of and some of the rules are known to us. For instance, boxers could not hold each other, a person wins if the other was knocked out or gave up, and there appears to be no rounds. Boxers also had certain equipment, such as straps and gloves similar to those used today (Figure 1). In the Medieval period in Europe, boxing seems to have been less pursued as a sport. There are records of occasional boxing matches or fights but these seem less regulated and less related to contests. By the 16th century, however, boxing once again became of interest in Europe. In particular, swords became less commonly used day-to-day, giving a reason for other contests, such as utilizing the fists, to develop. By 1681 in London, where England is arguably the birthplace of prizefighting, documented fights began to be recorded as formal contests. In 1719, the term "boxing" was formally used to describe the emerging sport. The first formal written rules were established by 1743. Boxing now had an referee, a set rule for a knockout or how a match was to be won, and rules about where boxers could not hit and when they could not hit, such as when the opponent was down a second blow could not be given. These so-called Broughton rules, named after an early champion who formalized the rules, were mostly concerned about safety, as deaths began to occur in this emerging sport. Similar to how other sports developed, safety began to create the parameters in which the sport took its form. This renewed interest may have stemmed from interest in Classical sources as well as changes in customs. The removal of other activities, with a new wealthy class emerging, gave space for boxing to emerge. The developing nation-states in Europe became less inclined to have their citizens utilize weapons on a day-to-day basis, giving greater interests in pursuits that seemed less threatening to the state. Figure 2. 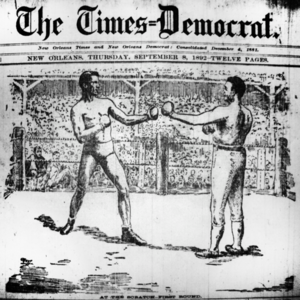 Newspapers became influential in promoting boxing and crowning its champions. By 1867, the so-called Marquess of Queensberry rules now regulated rounds to be fought, how long the rounds were to last (3 minutes), rest periods between rounds (1 minute), the size of the ring (24 square feet, or slightly bigger than today's rings), the ten second count if a fighter was knocked down, and that gloves can be used to block blows by an opponent. Weight classes were also introduced, which had a heavy, middle, and light weight fighters. Gloves were now regulated as well, where the gloves were to be essentially large bloated mittens. The rule regarding how gloves could be used to block blows was a critical one in how boxing was to develop. This now made boxing less of a "slugging" match, where opponents would often simply hit each other until the other was knocked out, to more of a strategic game that utilized the hands as well as the feet in evading and tiring the opponent. The use of gloves for defense also gave rise to what would become the boxing stance that most boxers today take, where they hold the gloves close to the face rather than keeping their hands low. Despite these new rules, boxing was still not held in great esteem and some places even banned it. Bare-knuckle fights were still common and safety was not of high standard. Prizefighting was also often banned, as it was associated with gambling and other activities seen as vices. This only changed in the late 19th century, when in 1891 the London National Sporting Club augmented the Queensberry rules by now formalizing how scoring would take place and placed more importance on the officials and referees. This emphasis was to give it more safety but to also formalize fighting so that one can win a fight without having to knockout the opponent. This now opened the door for boxing to become professional, as it was more acceptable for society to have fights that were tightly regulated. Soon, newspapers took an interest in advertising who they considered "champions." In the late 19th century and earl 20th century, champions were considered to be those who simply had a consensus around them(Figure 2). The early 20th century was also the period when saloons or pubs began to be associated with a place for knowing and hearing about a boxing match and its results. Saloon keepers would announce results as they occurred and were informed by telegraph. The use of newspapers and rise of boxing promoted in early film also helped boxing to be more acceptable to the general public and spread its interest, although boxing has never lost its connection with gambling. Amateur and professional boxing, although having a similar origin, began to diverge already in the 19th century. Prizefighting quickly became associated with professional fighting; however, amateur boxing began to emerge as an alternative that disassociated money from fighting. With the birth of the modern Olympics, by 1904 amateur boxing was now included into the games. The United States and United Kingdom became known as leaders in both professional and amateur boxing, but other countries or territories, in particular Cuba, gained a reputation for producing highly competitive boxers. The development of the International Boxing Association in 1946 helped to standardize and expand amateur boxing. By then, 24 countries joined and these countries became competitive in the international circuit and Olympic games. Professional boxing, meanwhile, continued in its climb of popularity. In 1908, Jack Johnson became the first black heavyweight champion that made boxing now also a racially-charged event in the United States. In the 1920s, prize money now eclipsed the one million mark in a famous fight between Jack Dempsey and Gene Tunney. In the 1930s, world events shaped boxing, as bouts between the American Joe Louis and German Max Schmeling became symbolic of world event and political and racial competition that led to World War II. However, despite the symbolic character of their fights, neither boxer fit their countries' ideals. Joe Louis was black and racial prejudice made him a less than ideal champion for some of the pubic, while Schmeling never liked the Nazis. In fact, he later stated in his life that he was happy to loose to Louis in 1938 so he avoided having to receive a medal from the Nazis. Boxing recovered in the late 1940s after a brief drop in interest during the war. After the war, other weight classes began to be of greater interest to the public, with fighters like Sugar Ray Robinson who was often a Featherweight fighter. The rise of Cassius Clay ( Muhammad Ali ) ushered a new Golden Age for heavyweight boxing, as it not only brought tremendous interest in fights but with medium of television, Ali introduced the concepts of "trash talking" and a more colorful personality to the sport that has since become not only a part of boxing but also other sports. He became a global phenomenon that has helped boxing to become one the most popular international sports. To this day, boxing has been shaped by its TV viewership and Ali's personality has left its influence on the sport. Boxing, like many other sports, has a long, historical development. Key events that shaped its history include changing interests in sports after the Medieval period, introduction of more rules to promote safety, renewed interests in Classical activities, and prizefighting. It took more strict regulation and the promotion of boxing by newspapers and film to help it become a more acceptable sport in the eyes of the wider public. Today, boxing is influenced by its often colorful personalities of its boxers as well as TV. As for the future of boxing, with the rise of the internet we are now seeing boxers beginning to promote themselves more online, while pay per view watching is now going online. Commercialization of the sport may continue, with major companies increasingly sponsoring or linking their names to main events. This may also mean more title belts to give companies more revenue streams. However, as we have seen with boxers like Ali, personalities may yet to change the sport once again. ↑ For more on the origins of boxing, see: Rodriguez, Robert G., and George Kimball. 2009. The Regulation of Boxing: A History and Comparative Analysis of Policies among American States. Jefferson, N.C: McFarland, pg. 23. ↑ For more on how boxing emerged in the ancient Greek world, see: Newby, Zahra. 2006. Athletics in the Ancient World. Classical World Series. Bristol: Bristol Classical, pg. 197. ↑ For more on the rise of boxing in Europe, see: Boddy, Kasia. 2009. Boxing: A Cultural History. First paperback pr. London: Reaktion. ↑ For more on early rules regulating boxing, see: Roberts, James B., and Alexander G. Skutt. 2011. The Boxing Register: International Boxing Hall of Fame Official Record Book. Ithaca, N.Y: McBooks Press, pg. 18. ↑ For more on the development of these rules, see: Vann, Mickey, and Gilbert Odd. 2010. Boxing in the United Kingdom: Marquess of Queensberry Rules, National Sporting Club. British Boxing Board of Control. General Publishing. ↑ For more on the London National Sporting Club's role in promoting boxing, see: Rodriguez, Robert G., and George Kimball. 2009. The Regulation of Boxing: A History and Comparative Analysis of Policies among American States. Jefferson, N.C: McFarland, pg. 30. 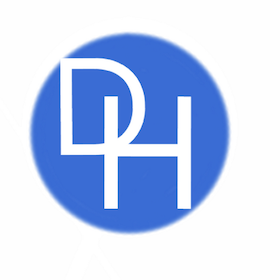 ↑ For more on how newspapers and other media influenced boxing, see: Streible, Dan. 2008. Fight Pictures: A History of Boxing and Early Cinema. Berkeley: University of California Press. ↑ For more on the history of amateur boxing, see: Scambler, Graham. 2005. Sport and Society: History, Power and Culture. Issues in Society. Maidenhead, Berkshire: Open Univ. Press. ↑ For more on early 20th professional boxing, see: King, Chris. 2013. Boxing: The Greatest Fighters of the 20th Century : A Complete Guide to the Top Names in Boxing, Shown in over 200 Dynamic Pictures. Wigston: Lorenz Books. ↑ For more on post-World War II boxing and the rise of the Golden Age of boxing, see: Experiencing the Golden Age of Boxing. 2014. Xlibris Corp.